HISTORY - My newsletters actually go back to 1971 or '72, when I distributed one in my neighborhood, printing it on a Hectograph. In more modern times I briefly published in the early days of this blog, 2008. When I had the bright idea of real-life meetings. Which, incidentally, was how I made a lasting friend, Garrett Al (aka Geritol and Jor-el). But in those days he was a maniac and sexually assaulted me, so it wasn't all good. We're OK now. 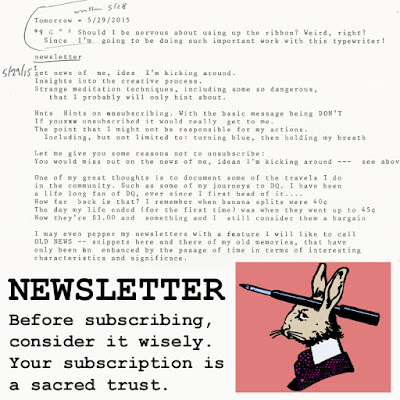 NEWS - One of the pluses to subscribing is the newsletter is it's a great place to get news of me and the ideas I'm kicking around. You get insights into the creative process, including some of my strange meditation techniques, some of them so dangerous I should probably only hint at them. I was being chased by demons when this newsletter idea came to me. SUBSCRIBING - I need to offer one big hint on unsubscribing, with the basic message about it being DON'T. When someone tries to unsubscribe it really gets to me. It's not pleasant and I can't be held responsible for my actions. The last time it happened I held my breath and ended up so blue I had to go in for painful skin-dying. You wouldn't want to unsubscribe anyway because you'd miss out on all the news of me, the ideas I'm kicking around, etc. 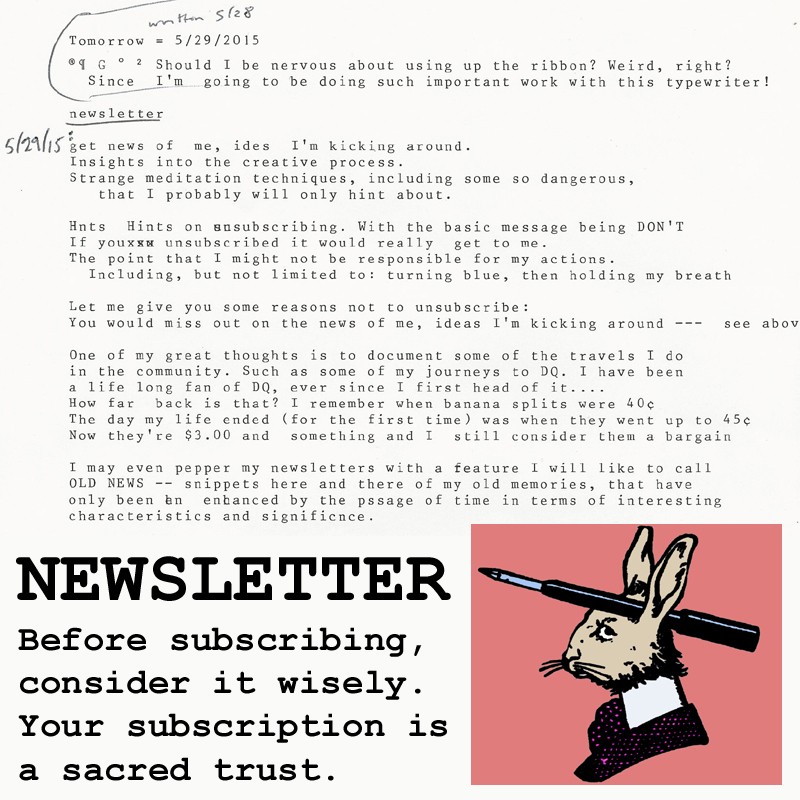 In conclusion, I consider a subscription to my newsletter a sacred trust. With something like that, your eternal security could hang in the balance. MY TRAVELS - Something I like putting in my newsletter is a record of my travels in the community. Which part of town will I be in today? Only subscribers know! Will I be at DQ? Perhaps. I've been a lifelong fan of DQ ever since I heard of it. How far back would that be? I wrote about it in my early '70s newsletters. I had an article about their banana splits being 40 cents. Then 45 cents! That's the day my life ended (the first time), when they raised the price. Now they're $3.39, a good bargain. PEPPERING - I may even pepper my newsletters with a feature called OLD NEWS, snippets here and there of old memories, that are enhanced in their interest by the passage of time. One item of OLD NEWS I can think of right now concerns how much I would daydream when I was a kid. I used to sit in my room and stare at the air itself! I'd watch dust motes floating in the sunlight for hours, then feel sad when I had to leave them. Now, even though it's been over 50 years, I still sometimes wonder what ever became of those old friends.